It has been a long time between posts. We have been busy with work and messing around in the kitchen and with life. We are not super out going but we do like to get out and go places. We took a nice drive past 4 different reservoirs last weekend. It was so pretty to see how high the water was. We have had so much rain this year that the water levels are high and the mountains are still green. Most of the photos were taken from the car window at 50 to 75 miles per hour telling you that I have a great camera that deals with motion senor. We stopped at the last reservoir and talked to a couple of bikers from Ohio who were in awe of the big beautiful mountains. Everything in Ohio is flat and full of corn, bean and wheat. It was a treat for them to see the big mountains and great waters. Now that it has stopped the constant raining I guess we will have to get our fishing licenses and go up more often and go fishing. Get out and enjoy!!. This dinner is just a basic chicken breast with beans and couscous. 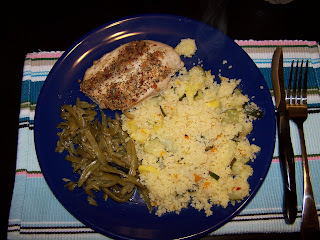 It turned out so flavorful because of the spice rub on the chicken and the squash and zucchini in the couscous. 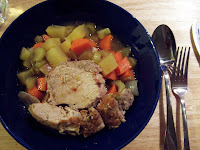 It is also a great meal for those watching their blood pressure because there is no salt in this at all, but it is not lacking in any flavor. It is a basic baked chicken breast with a special herb crust. 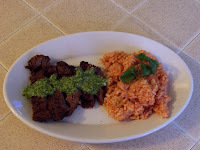 It is an Organic No Salt Seasoning from Kirkland Signature. David just made a paste using this and olive oil and rubbed placed it into a zip lock back for about 1 hour (you can do this for up to over night) then made sure that a good crust of it was covering the chicken when put into bake. While the chicken is baking you make the couscous according to directions and then add some 1 inch chopped zucchini and yellow squash. For a bit of extra spice you add a dash or two of the same Organic No-Salt Seasoning to the water when making the couscous. In another pot put your beans with a pat of butter (which you can forgo) and a little dill. Plate and serve. There was enough couscous for a nice vegetarian lunch the next day. I went out last night with the Big Ladies Club to see Twilight. The movie turned out better than I had anticipated. Hair, makeup and costumes fell short but the rest of the movie was good. It makes me want to read the books again. Let me give you some history on the "Big Ladies Club". This started many years ago with my two Aunts on my fathers side, D & S. They wanted a night out without children or husbands. I am not quite sure how I got into the mix but I am grateful I did. D's oldest daughter was in the stages of opposites, black - white, tall-short, etc. When D told her that she couldn't come because she wasn't old enough to go. Her daughter told her "Oh it is just for big ladies" since she was a little girl. Hence we became the "Big Ladies Club" We have been going to movies and dinner for several years now and have a great time. Seeing movies that husbands and kids don't want to see. Well over the years the "little" girls are all grown up now and "Big Ladies" themselves and are able to join us. We went to dinner after Twilight and talked about how Edward could tote us around the woods as much as he wanted. That even though we are not sixteen year old girls by any means it still makes us fell young at heart. We reminisced about being teenagers, stories of cars and boys, parents and grandparents, brothers and sisters. We were loud and laughing for about 3 hours at the restaurant. Nothing my family does is quiet since half of us are deaf. The only thing we were missing was two of the ladies. S's youngest and my sister Debie. D moved down to sit next to S in the theater leaving her two daughters and they were jokingly miffed saying "thanks mom I see where we stand" I told them that they were just daughters and that sisters were more important. It came up again at dinner and D said that she gets to see her daughters way more than she does her sister. I said well at least you get to see her. Mine lives too far away. It isn't fair how little I get to see her. But when I do get to visit I enjoy thoroughly! We missed the two ladies greatly. We vowed at the end of dinner to go out again for the new Harry Potter movie unless we can see something coming out better sooner. I guess this means I need to actually read HP and see the movies. I should be able to do that easily by next summer. 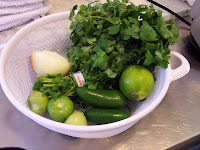 Combine all ingredients and meat into a glass bowl or zip lock. Let sit over night. Grill meat until medium well. Put all into a food processor and let it rip. Until into thick liquid look. Combine all into sauce pot, bring to boil. Remove pot and let sit for 10 min stiring a few times. A little bit of History of the Apt in SLC. David moved in about 7 years ago. David and Marilee met, fell in love and Marilee proceeded to move in a year after David did. Two years after that in 2005 we were married and have continued to stay in the Apt in SLC. We like it, even though it can seem a bit cramped at times. We have done many improvements to it over the years. New outlets, lights, paint, drapes, and fixtures. We put in the Stainless counter/table in the kitchen to have more work and storage space but it can get tricky to have both of us in there at the same time. It is a squeeze to pass eachother in the kitchen. I think that I why let David do most of the cooking, OK if not all, because he does a WAY better job, and I don't get in the way. We repainted the entire kitchen, it was originally supposed to be green on green but the little old man at the paint counter got our cans of green mixed up and gave us the wrong amounts of each green. It did not look right at all. 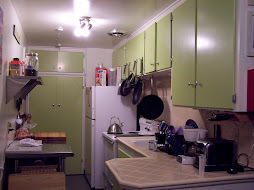 So we went with the lighter green cabinets and white walls. We added the stainless nobs and it turned out to look pretty good. I noticed the other day that it looked like the same color as the lemon grass in my soup at the Thai Resturant we go to. So I started calling it the Lemon Grass Kitchen. You will see lots of shots of our Little Lemon Grass Kitchen on this blog. Hope you like it! We found the most beautiful Pork Roast for dinner on Friday. David and I both had the day off and decided to get the weekend started right by making some great food. We had decided to slow cook it so we could take all day and do our normal clean the Apt and shop and what not. It is so nice to be able to run around town and do all that you need to when everyone else is at work. We got home from shopping and David proceeded to work wonders in our small but workable, lemon grass kitchen. note: Were going to use the name "Cozy Kitchen" instead of lemon grass. Now how much you use of each item is up to you. If you only like onions for taste but don't like to munch on them just put in enough for taste. Same thing with the garlic. I make David put in lots of Carrots and Potato's because I am a native Utahn and I need my taters. 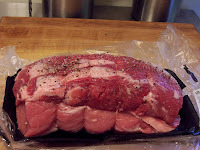 Put your Salt, Pepper and Seasoning on the Roast which has set out to room tempature. Heat the olive oil up in a large skillet. Sear the Roast on all sides until brown. Once browned place in water, vinegar, seasoning mixture in the Slow Cooker. Place for 4 hours to cook. If you want to take longer, then by all means set it for a lower tempeture and cook it for longer. When it has cooked for 3 hours peel and dice your vegetables and place them in with the Roast. Cook for the rest of the time or until your vegetables are tender. 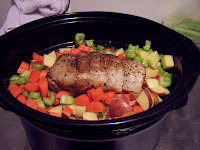 Take the roast and all the vegetables out of the slow cooker and drain the juice to a saute pan. Mix some corn starch and water for thickening and put in with the roast drippings for home made gravy. Well this is my first post ever. I figure it is nearing the end of 2008 and if my super busy sister can find time to post on a blog and keep me and the rest of the world updated on her and her men, I should take the time out of my lazy life to keep you all up to date on my life. I don't do a whole lot other than work, come home and eat way too much of Davids way too good cooking. Most of this site will be dedicated to food. It is what we love to do. It is why I have the figure I do. I keep telling myself I am not a six foot man and to stop eating that way, but he cooks just soooo good I can't help myself! Keep an eye out for some tasty recipes this weekend and some gorgeous photos to go with them. I have a feeling we will be inside since we were hit with huge amounts of snow today! aaahhhh! !